The Electronic Verification Code (EVC) can be used to check the authenticity of the reports issued by the Homologations Area of Applus IDIADA. This code is the combination of the report number (or file number) and the security code of the document. This combination is unique and any modification made in a report generates a new security code. Write the File Number (or report number) you will find at the right-hand border of the report pages. With security code: write the security code you can find on the text at the right-hand border of the report page. If you scan the QR code at the top right corner, you will be redirected to this page with the file number and the security code introduced automatically. With original digital copy: if you have an original digital copy in PDF, you can verify the integrity and authenticity of the document by uploading the original copy. The system will check against our database if the document is exactly the same. Scanned copies cannot be verified with this method. Write down the text in the image (captcha) to verify you are not a robot preventing a misuse of the service. Click check to verify the information introduced. A message informing if all information is correct or not will appear. Moreover, if the information is correct, a View button will appear, with which you can preview the first page of the document and compare it against your copy, or a Download button, with which you can download the full original file or report (for vehicle Homologation or Modification in Spain only). Documents issued by the Homologations Area of Applus IDIADA (Final Reports) are protected against modifications and digitally signed using a digital certificate. This digital certificate indicates that the document is authentic and has not been modified. If the document is enabled for download, to validate the digital certificate and to verify the authenticity of the document, you must use Adobe Reader to open the document. You can download it for free from here. Follow this Adobe guide about how to update the trusted certificates in Adobe Reader: Adobe Help. You can also validate the document certificate in the following link of the Spanish Government: Valida-E. If the incident persists, please inform your contact in IDIADA and we will contact you. 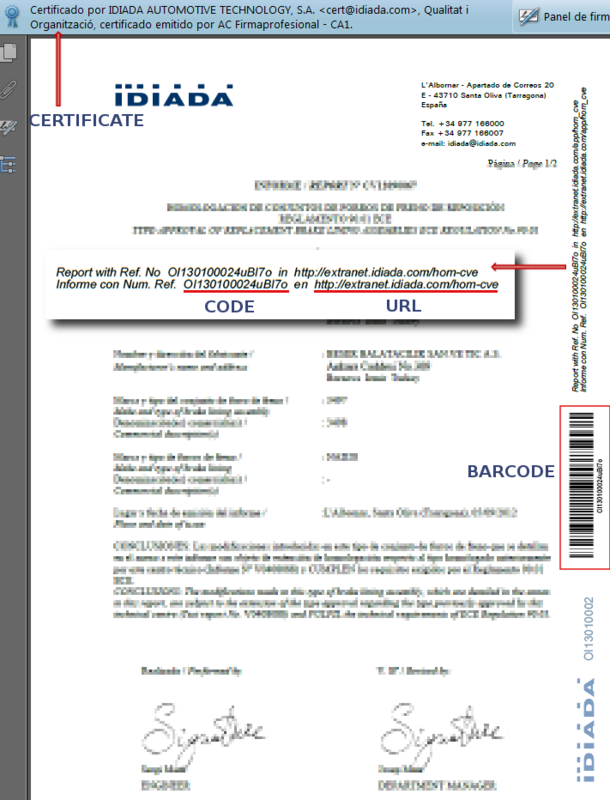 The modern approval certificates issued by the Spanish type Approval includes a grey part in the left side where you can find the instructions to verify the originality of the document. You need to go to the webpage included there (usually: www.minetad.gob.es/arce or www.minetur.gob.es/arce , but check the one appearing in the certificate to verify) and introduce the code that appears next to this, then you will be able to confirm the originality of the documents. In order to follow up your questions, they will be registered and a registration number will be assigned to them. The replies will be sent to the e-mail address indicated in your communication. For this purpose, a digital certificate is not needed.